Fuelade has been rigorously tested by the Southwest Research Institute, one of the most prestigious testing facilities in the United States, to ensure compliance with the ASTM D975 Standards for diesel fuel. The results of the testing show that Fuelade is a completely safe product that causes no wear to engines. In fact, over the road testing has shown it to enhance the efficiency and cleanliness of the engine’s combustion chamber. View the Fuelade ASTM document. Fuelade is a completely organic, green and safe product. 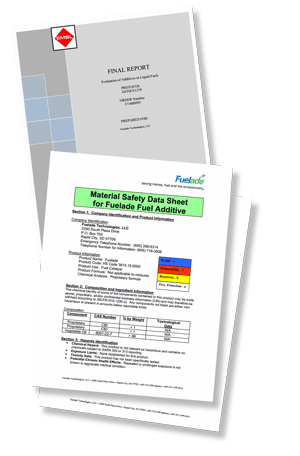 View the Fuelade MSDS document.